The most important and complicated component in your overhead door system is the opener. This electro-mechanical unit is what enables the automatic lifting and lowering of the door. There are lots of problems that can arise when it comes to this part of your system, from circuit board glitches to frayed wiring and broken motor gears. Our technicians can handle all of this and more – we can also install a completely new opener if necessary. It’s easy for a system as complicated as an opener to develop faults. The solutions can range from safety sensor adjustment to a new circuit board. Our technicians always go the extra mile to ensure your problem is solved quickly and effectively, and in many cases can replace broken parts on the spot. If at all possible, it’s best to prevent problems from arising in the first place. Regular maintenance is key – during a service visit, our technicians will check each component, from the rail and trolley to the drive chain and motor gear, for signs of wear and damage. As part of this service our team will also test the safety features fitted to your door, ensuring that the photo-electric eyes and reversal feature are properly calibrated. Our team is on hand to install brand new opener units. 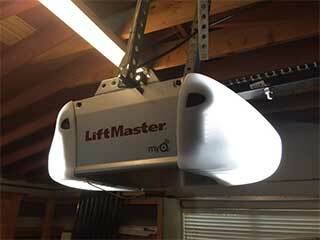 We offer a wide range, including well-known brands like LiftMaster and Chamberlain. We can also fit units you’ve purchased yourself. Our technicians will ensure your opener is securely attached to strong ceiling blocking, and is properly configured to work with the rest of your overhead door system. Which Type Of Opener Is Best? Homeowners can choose between three main types of opener system. Chain drives, while affordable and reliable, are noisy. Belt drives are quieter but more costly, and screw drives which make a lot of noise but require very little maintenance. Our team is happy to advise you on the right unit for your home. Whether your opener is in need of some repair work, or you need a new unit to be installed, our team is perfect for the job. Contact Garage Door Repair Carlsbad today to find out what we can do for you.